And God said unto Noah…make thee an ark of gopher wood; rooms shalt thou make in the ark, and shalt pitch it within and without with pitch. Sometimes when I read that verse I think, “That’s kind of funny that he repeated himself. Pitch it within and without with pitch. Just say, “Pitch the ark within and without.” 😀 But God never wastes words. It turns out they are two different (but closely related) words. One is a substance, the other is an action. I didn’t realize that ‘pitch’ could be so exciting, either! A window shalt thou make to the ark, and in a cubit shalt thou finish it above; and the door of the ark shalt thou set in the side thereof; [with] lower, second, and third [stories] shalt thou make it. This has been very encouraging to me recently as I hear of more laws that take away my liberties, of more foods being contaminated, of wars, of sicknesses. Jesus is so much bigger than all of it. “He that sits in the heavens shall laugh at the bad guys.” [JPV-Jessica’s Paraphrased Version]. God commanded Noah to bring two of every animal, then God brought the animals to Noah. That’s what God’s grace does. Jesus does for us what God commanded us to do! Food: I looked up the word for food…and it means…food 😀 “an eatable; includes provender, flesh and fruit” it comes from another word which means ” to consume, burn up, dine, feed freely, plenty”. So Noah’s family had plenty in the midst of world chaos. They were not rationing! How amazing is our God?!!! Very amazing. Very, very amazing! You’ll hear the winds, the floods, the storm, but don’t look out…look up! 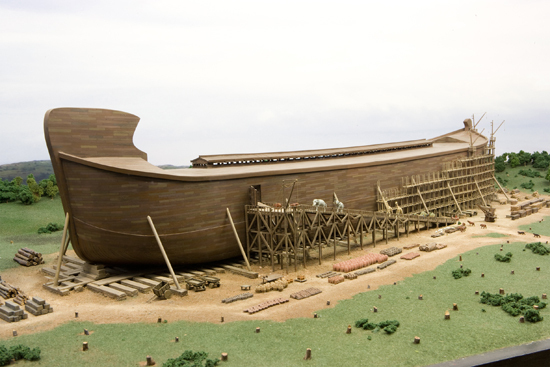 Oh you know that life size Ark, I would Love to go see it. Thank you, Jessica, for this very powerful reminder that no matter the troubles we face, God is mightier & stronger than them all. God bless!